Killorn with mad patience on his goal. Mad. Best thing about the game is that we jumped Montreal. Now if we can beat them head to head next week. Cote was not that bad. Man can he pass the puck. Cote got lit on fire one on one by Hornqvist in the First Period. He played very little after that. It's one play, but it remains to be seen if he will acclimate to the pace at this level. Ultimately, he's a Band-Aid and I think Yzerman needs to go find this team's equivalent of Darryl Sydor. I'm sure this has been mentioned, but I love the way the schedule sets up in this stretch. If we can push aside a couple of former SouthLeast rivals in Carolina and Floriduh, we'll have five days off to rest up and make the big pre-Olympics push. I know Pete has been dutifully breaking down the season into 10-game chunks, but we all know that everyone outside the Bolts' locker room is counting the days until Stammer's return starts to become a reality. We've got a real chance to hold onto our playoff spot, and come January it could turn into actual playoff momentum knowing that one of the best players on Earth is going to ride in like the cavalry. Hopefully Crombeen didn't do any damage to his hand or knuckles after his fight with Hendricks. He had a few punches land on the helmet and he had a giant ice bag on his hand in the penalty box. He played some more afterwards, but waiting to hear whether it swelled up on him overnight. Didn't get to watch the whole game, but saw the last half. How did Cote play? I didnt see him on the ice much of the 2nd half of the game but he was there on the last shift. 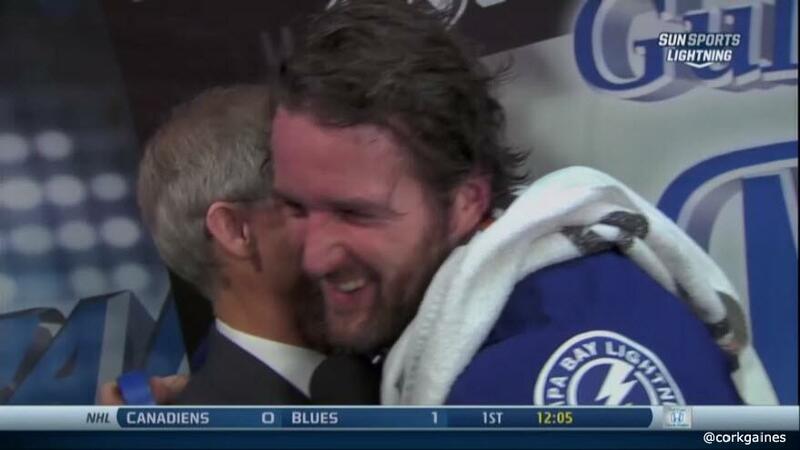 So Kucherov got his "game-ly" breakaway... haha, i dont know what it is but he knows the tricks. Nice to see some of the ones slumping on the scoresheet. Also, makes you wonder if Lindback can become that #1 starter if he got a little goal support every game. (Team avg 1.63 goals per game when he has been in goal this year) Doesn't have the flashy saves Bish has, but his rebound control and positioning is heads above last years. Lastly, looks like the Brown-Thompson-Kucherov line has become quite the dynamic trio. Lindback had a legitimate bad start to the season, looked shaky, couldnt catch a puck or control rebounds, exacerbated by playing the like of Boston and Pittsburgh, but he definitely looks more comfortable recently, and only just now got the goal support. Hopefully that whole trend remains on the upswing and I'd love to see him continue to get winnable starts in that context. What an awesome game to watch. Right out of the gate they take the lead, never to give it up...Cote gets his first NHL point...stellar game from Lindback...whenver NSH scored a PPG they came right back with a goal of their own...Hedman looked totally fine in his return, making some sick passes....Killorn scored while also registering a shot on goal...another 2 pts. vs. the West,...and all without Steven Stamkos. What's not to like? Also, makes you wonder if Lindback can become that #1 starter if he got a little goal support every game. He'll come back at about the 57 game mark of the season, as I recall. Assuming it takes a few games to knock off the rust, that hopefully means we get 20 games of proper Stamkos hockey to finish off the regular season. Right now the team just finished game 35, so the goal needs to be to continue to nail these targets for points for the next 25 games and then hope Stammer comes back at somewhere approaching full strength, thereby boosting the offense by almost 1 goal a game and taking pressure off the D and G's. That's like getting a 50-goal scorer at the deadline for free, which is a sweet little circumstance for the team. At that point, Yzerman really needs to get at least 1 more defenseman for the stretch run, too.